A long walk, a lot of good perspective and today I’m reassuring myself that starting our second location at the Gates and Hillman Centers on the CMU campus is and has been a “process” – it kinda feels like I’m having a baby elephant and it’s taking about as long too! 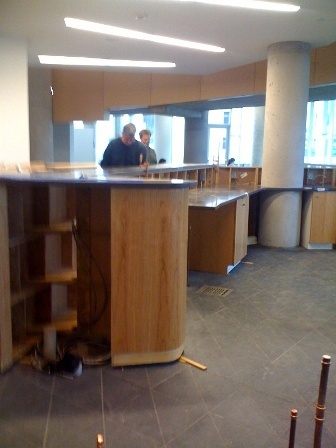 Today was the beginning of the counter and cabinet installation and we have a great bunch of skilled craftmen working on our space – plumbers, electricians, carpenters etc. Thanks, guys…tomorrow coffee and donuts for YOU! Yep, it will be amazing and beautiful and we’ll call it Tazza D’Oro!